75-year old Paddy Jones and her 35 year old partner, Nico, a local dance school instructor, performed and went on to win Spain's national talent competition Tu Si Que Vales (You're really worth it). Tu Si Que Vales is the Spanish equivalent of Britain's Got Talent. To the amazement of the judges, the dance routine Paddy and Nico performed was salsa acrobatica. This is not just a salsa routine, which is hard enough in and of itself, but salsa with acrobatics in it! CNN calls Jones, "Spain's answer to Susan Boyle." The hearts of millions were touched as we watched and listened to Susan Boyle's rendition of "I Dreamed a Dream." Boyle's new album, "hit the top of the Billboard 200 albums chart with 701,000 copies sold in its first week, according to Nielsen SoundScan." [CNN, 12/11/09]. Boyle's album is currently available at amazon.com. I am a always on the lookout for inspiring and empowering instances where people break through expectations and outdo themselves. In so doing they inspire me and probably countless others to not let our circumstances stiffle and keep us in our own individual ruts. What inspires you? What have you read or seen lately that has touched your soul and motivated you to try harder, go further, attempt more? Write back and let us know. Whitney Houston's "I didn't know my own strength," is inspiring to me. The song comes from her 7th studio album, "I Look to you." The complete lyrics to Whitney's song are posted at the Music Videos and Lyrics - Music Lovers Group site. Here are just some of the lines that touched me the most, though I found the entire song a testament to the power of the human spirit. Lost touch with my soul. I had no where to turn...Lost sight of my dream, Thought it would be the end of me. I thought I’d never make it through. I had no hope to hold on to...I didn’t know my own strength. Found hope in my heart, I found the light to life, My way out the dark. Found all that I need, Here inside of me...I didn't kow my own strength. My faith kept me alive, I picked myself back up, Hold my head up high, I was not built to break. I didn’t know my own strength. The lyrics of Whitney's song, and the way she's appropriating them to her own life, remind me of the passage, "No test that comes your way is beyond the course of what others have had to face." The message is true to her life. It certainly can be true of each of our lives as well. Here's to all of us tapping into our own inner strengths. It's a pleasure finding a straight-to-the-point and easy-to-follow article on writing flash fiction. It's an even greater pleasure when its author graciously allows CCF to post it to its site: 6 Steps to Writing Flash Fiction. In a simple and straight-to-the-point manner, Paul Alan Fahey walks us through the steps involved in writing flash fiction. Whether they’re called blasters, postcard fiction, micro-fiction, sudden fiction, short shorts or flash fiction, the essence of the genre is the same. The writer quickly gets into the story, establishes setting and character, sets up the conflict, fills-in critical back-story, then heads faster than a speeding bullet toward the climax and resolution. Then Fahey goes on to use a flash fiction piece he wrote to illustrate the 6 steps to follow when we're writing flash fiction of our own. I happened upon this video clip where First Lady Michelle Obama talks about health care reform from the point of view of women, mothers, and families. I connected with her words because that's the way I've been filtering the news on the subject. Every time I listen to a news report on the status of health care reform I always think of my children, my husband, myself, my sisters, i.e., my family. The news is often about what Democrats or Republicans are or are not doing about reform, so I've kept from writing my thoughts on the subject. But Michelle's words touched me. She states that, "I want to focus my attention on where policy and people intersect." I connected with her words. That's where my heart is. The video also has cancer survivor Roxi Griffin talking about her personal journey, from dealing with copays of $27,000 to now facing copays of over $100,000. In her case, the high copay keeps her from getting screenings. I think it would keep me from getting them as well. Griffin tells us that, "people need to realize this is not a political issue. To me it is a moral issue. And people need to stop and think about the ramifications it has on families when they are not able to take care of their medical needs." I agree. Watching the video I was shocked to hear Kathleen Sebelius, Secretary of Health and Human Services, say that, "insurance companies are allowed by law to charge women more than men. Sometimes significantly more." Sebelius goes on to say that, "too often insurance benefits don't cover the benefits that women need...at every point along the way, women are being discriminated upon by insurance companies." What are your thoughts? How do you feel about what is going on? Do you agree with Griffin that this is a moral and not just a political issue? I'd love to hear from you. 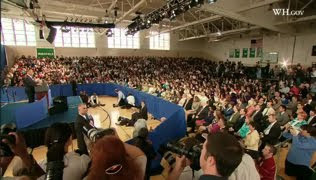 On September 8, 2009, President Barack Obama gave a speech directly to America's students. He spoke from Wakefield High School, Arlington, VA, as students tuned in from all across America, from kindergarten to 12th grade. I was moved as I listened to the speech, not by the inspiring stories nor the encouraging words but, rather, by the freedom his words embodied. He called students to set their own goals and go for them. I cried when he said to the students that, "no one has written your destiny for you, because here in America you write your own destiny, you make your own future." I cried because I remember being in 6th grade in Cuba and looking around the classroom knowing what each of my classmates was going to be when they grew up not because they were writing their own destinies, but because the teacher had just finished telling them what they were going to do with the rest of their lives. They had no choice. It had been decided for them. Every single one of you has something that you're good at. Every single one of you has something to offer. And you have the responsibility to yourself to discover what that is. That's the opportunity an education can provide. No matter what you want to do with your life, I guarantee that you'll need an education to do it. You cannot drop out of school and just drop into a good job. You've got to train for it, and work for it, and learn for it...The future of America depends on you. If you quit on school, you're not just quitting on yourself, you're quitting on your country. The circumstances of your life, what you look like, where you come from, how much money you have, what you've got going on at home, none of that is an excuse for neglecting your homework or having a bad attitude in school. There's no excuse for not trying. Where you are right now doesn't have to determine where you'll end up. No one has written your destiny for you, because here in America you write your own destiny, you make your own future. Today I'm calling on each of you to set your own goals for your education and do everything you can to meet them. Your goal can be something as simple as doing all your homework, paying attention in class, or spending some time each day reading a book...But whatever you resolve to do, I want you to commit to it. I want you to really work at it. The truth is, being successful is hard...And you won't necessarily succeed at everything the first time you try it. Some of the most successful people in the world are the ones who've had the most failures. These people succeeded because they understood that you can't let your failures define you. You have to let your failures teach you...No one is born being good at all things. You become good at things through hard work. Don't be afraid to ask questions. Don't be afraid to ask for help when you need it. I do that every day. Asking for help isn't a sign of weakness. It's a sign of strength. And even when you struggle, even when you're discouraged, and you feel like other people have given up on you, don't ever give up on yourself. Because when you give up on yourself, you give up on your country. The story of America...is about people...who loved their country too much to do anything less than their best. So today I want to ask all of you, what's your contribution gonna be? What problems are you going to solve? What discoveries will you make? I expect all of you to get serious this year...I expect great things from each of you. So don't let us down. Don't let your family down or your country down and most of all, don't let yourself down. Make us all proud. In America students get to write their own destiny. In Cuba the communist government gets to write it for them. In the USA not only are we what we learn, we each get to choose what we learn in order to be who we want to be. As I listened to President Obama's speech I thanked God for the privilege of living in the good old U.S. of A. On August 16, 2009, Fareed Zakaria showcased Cuba's toilet paper crisis during his "What in the world?" segment on his Fareed Zakaria GPS Sunday program. Before I left Cuba I well remember when toilet paper stopped being the soft paper we were used to and became something closer to that of a paper bag consistency. Not pleasant to use. Now, years later, we hear that even low quality toilet paper may join the list of scarce items on the island. In the following video clip, Zakaria tells us that, "the government has warned its citizens in recent days that they are facing a toilet paper shortage...that may last until the end of the year." It's not as if Cuba had an abundance of toilet paper to begin with. Our family friends, when they travel to Cuba, take their own toilet paper with them...and often have it taken away by Cuban custom officers once they land on the island. For the government to make an announcement that there is going to be shortage of toilet paper just means there will be little or no toilet paper to be had. "Just two weeks ago, Raul Castro vowed yet again to keep communism alive in Cuba, to make sure capitalism doesn't return. In a world of flux, I suppose it is comforting to know that some things stay the same. Cuba's disastrous economy would be a joke were it not for the poverty it has perpetuated among millions of Cubans. The whole country is stagnating. Fifty percent of its arable fields are going unfarmed. First and second year college students now work one month out of the year in agriculture. Its insane farm policies lead to frequent shortages of fruit, vegetables and other basic food needs, shortages even more serious than toilet paper. And all those programs that held up for years as successes of the communist revolution, free education for all through college, universal health care, well Raul Castro just announced they're going to have to make cuts in all of these. Meawhile the average Cuban still earns the equivalent of less than $20 per month. Now, capitalism has its problems as we have all seen, but at least we are not running out of toilet paper." Hasta cuando, Dios mio, how much longer, Dear God, until Cuba once more not only has enough toilet paper, and food, and medicine but also for its citizens to have freedoms we take for granted here in the USA... freedom to be and to think and to dream and to follow our hearts into a future of our own choosing. A book I consider to be a "must read" for young and old alike is coming out as a movie this December. The book is The Lovely Bones, by Alice Sebold, and the trailer promises us a movie that will be a good depiction of this Young Adult title. In The Lovely Bones, Sebold gives us a story of a young girl's life, terminated much too early, at the age of 14, at the hands of a murderer. We learn this from the very first pages of the story. The trailer shows us that as well. But this is just the beginning of what turns out to be a heartbreaking and compelling read. We feel we must stay with Susie Salmon, the 14-year old protagonist. Her voice and life, even after death, carries us forward. We feel her bliss as she first goes to heaven, and find ourselves urging her on to bring her murderer to justice when she decides this is what she must do. In order to accomplish her goal, Susie will leave her perfect world in the heaven she finds herself in after she's killed. She'll also have to get her loved ones involved. How and why she does it will keep the reader turning page after page until the very end of the novel. Dreamworks is bringing out the movie version of this novel on December 2009, with Academy Award Winning Director Peter Jackson at the helm. I hope movie goers will be rewarded with the same powerful emotions that the book elicited for its countless readers. Come back and let me know how you like the movie once it comes out. And if you read the book, also tell me what you thought about it. In order to have our voices heard, there is a difference between energizing citizens to get involved and inciting mobs to riot. Obama and his team did the former during this past presidential campaign. GOP members, to their shame, are doing the latter at health care reform town hall meetings. Even worse, they're relishing their actions. Shame on GOP members for cheering and applauding Congressman Todd Akin of Missouri when he said that, "Different people from Washington, D.C. have come back to their districts and had town hall meetings and they almost got lynched." [from the transcript of the Rachel Maddow show on 8/6/09]. Does this Republican congressman and his audience understand what it is they're saying and applauding? How can Republicans be for disrupting the democratic process of a town hall meeting? 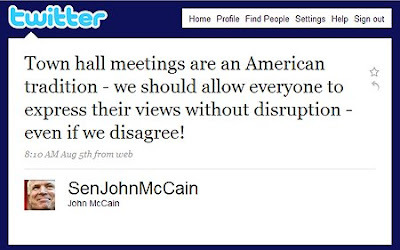 Senator John McCain, to his credit, has come out against this type of behavior. Rachel Maddow said on her August 6th show that, "Public figures have two options when political circumstances reach a point that's somewhere between extreme rhetoric and physical violence. You can condone the threats and then risk being seen as complicit to whatever comes next, or you can step up and be an adult, try to do something to restore civility." My hope is that Republicans will do just that. That they'll energize GOP members not just to be active participants in the national health care reform conversation but to encourage them to do it constructively. We are better than what's being shown of us on national TV these days. We can and should be coherent in our ideas, our questions, our concerns. Perhaps the problem lies in the reality that everyday Republicans are not necessarily the ones showing up and disrupting the town hall meetings. In the following clip, Rachel Maddow talks with Chris Hayes, of The Nation, and they comment on the disruptive behavior being shown by Republicans at these meetings. As the clips log-line states, in this clip you'll see Maddow reviewing the history of fake conservative protests. According to this clip, the current rabble-rousers do not represent the best and highest the Republican party has to offer. It might be good for everyday Republicans to join the national conversation and bring their thoughts, ideas, questions, and concerns to the meetings, rather than allow counter-productive self-serving parties to send their hand-picked representatives to speak on their behalf. Today is President Obama's birthday. Our 44th president turns 48 today. I find myself singing "Happy Birthday, Prez Obama" and silently wishing him many more birthdays to come. At the same time I have to wonder about the folks Eugene Robinson talks about in his article on The Washington Post, "The Berserk 'Birthers'." The article is about people who still believe that President Obama was not born in the USA and, therefore, is not elegible to be President. It's easy to want to dismiss the Birthers as some lunatic fringe. The problem with doing this is that, in his article, Robinson tells us that according to Research 2000, "28 percent of Republicans actually think that Obama was not born in the United States and a separate 30 percent are 'not sure'." That's 58% of GOP members. Wow. I've been a GOP member all my life. Lately I've been calling myself "a thinking Republican," in an effort to distance myself from what is surely becoming a lunatic segment in the GOP. How in the world could 58% of Republicans not be sure of Obama's birthplace? On the Morning Joe video clip above, Robinson says that, "Trying to analyze the "birther" phenomenon would mean taking it seriously, and taking it seriously would be like arguing about the color of unicorns. About all that can be said is that a bunch of lost, confused and frightened people have decided to seek refuge in conspiratorial make-believe. I hope they're harmless. And I hope they seek help." I agree with Robinson. In Spanish we have a saying that summarizes things and declares the subject is closed, in the same way a period at the end of a sentence closes that thought, that sentence. "Punto y aparte," is what we say, "Period. End of discussion." And after listening to Robinson on Morning Joe, and reading his Washington Post article, punto y aparte is what I say to the whole birthers phenomenon. It's not just a few people but thousands upon thousands who are protesting the results of the Iranian elections. And now with Michael Jackson's death, Iran has dropped off of the news cycle...and here in the USA it seems as if all the news is talking about is Michael Jackson. So it's fitting to put one of his songs to showcase the plight of the Iranian people. 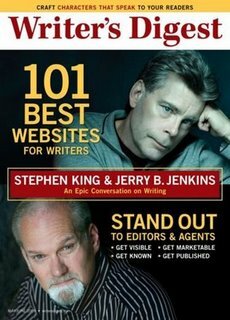 If you're a writer, and do not already subscribe to Writer's Digest magazine, then articles such as the Stephen King & Jerry Jenkins interview in the May/June 2009 issue might just convince you to do so. I received the magazine and was surprised to see the photos on the cover. It never would have occurred to me to put Jenkins anywhere near King. Not only are their writing styles different, the writing themes are different as well. You read one of Jenkins' "Left Behind" titles and you've read them all. King, on the other hand, delightfully surprises you each and every time. King's response to WD's question on readers suspending disbelief and immersing themselves in imagined worlds: "Making people believe the unbelievable is no trick; it's work. And I think Jerry would agree that belief and reader absorption come in the details: An overturned tricycle in the gutter of an abandoned neighborhood can stand for everything...Of course, none of this means a lot without characters the reader cares about...but the details are always the starting place in speculative or fantasy fiction. They must be clear and textured. The writer must have a good imagination to begin with, but the imagination has to be muscular, which means it must be exercised in a disciplined way, day in and day out, by writing, failing, succeeding and revising." King's response to WD's question on why the battle between good and evil fascinates readers: "When evil is vanquished in a book, most of us feel cathartic triumph...But writers must be fair and remember even bad guys (most of them, anyway) see themselves as good--they are the heroes of their own lives. Giving them a fair chance as characters can create some interesting shades of gray--and shades of gray are also a part of life." Regarding the challenge of writing for what King calls "constant readers," an author's devoted fan base: "They just want a good story, and I think they come to crave your voice even more than the story itself. It's like having a visit with an old friend." Jenkins also had some gems on writing he shared with us in the interview. One that I thought was specially insightful was his take on fiction and nonfiction: "Ironically, the definitions of nonfiction and fiction have flip-flopped these days. Nonfiction has to be unbelievable, and fiction has to be believable. So, to my mind, the task (and I agree with Stephen that it's not trick) of getting readers to buy your premise and temporarily suspend disbelief is to yourself believe your premise with all your heart. Another good quote from Jenkins was this one, "As to why people like to escape into other worlds, that has to do with this world. People are longing for something beyond themselves and their current circumstances. They want either hope or escape--or both." Stephen King wrote what I consider to be one of the best books on writing and he talks about it in the interview, "For me, On Writing: A Memoir of the Craft felt like both a summing-up and an articulation of things I'd been doing almost entirely by instinct." Even though I own a good number of books on writing, King's title is a favorite of mine. In King's book you not only learn about writing from someone who knows the art and craft of writing but you also get to know King as a person. Prior to me reading On Writing, I had pigeonholed King as a writer of horror fiction. He may be that but he's so much more. In the same way that he comes across in his book On Writing, self-effacing and transparent, he also comes across in the Writer's Digest interview. I mean, don't you just love it when the author Writer's Digest calls, "arguably the best-known writer of our time," ends the interview by saying, "Last but not least--we're all amateurs at this job, really. It's always new. For me (to quote Foreigner), it always feels like the first time." Kudos to Writer's Digest for capturing yet another set of King's words for us. Kudos to them for also bringing two unlikely authors together in one cohesive interview that allows us to, in WD's words, "look closer. A conversation with the two yields both parallels and polarity--and candid insights as well as mutual respect." I've looked to see where this Writer's Digest interview of King & Jenkins is available online, for a price, but have not found it. Let me know if you find it online or, if you get Writer's Digest, and have read the interview, come on back and share your thoughts with me. Immediately after I sent a note to the books4children listserve asking for advice on whether buying a Kindle from amazon.com was a good idea, a post from author Peggy Tibbetts came back singing the praises of this little gadget. In her blog, Kindle Spirits, Tibbetts addresses many of the questions I had about the Kindle. She also provides links to further information and suggests the two "must have" accessories: the Kindle travel case and the Mighty Bright Light. One thing Tibbetts mentions also helped seal the deal for me: the fact that I can edit manuscripts in the Kindle! I'm now blaming Tibbetts for this last minute addition to my Christmas 2008 list. I had to wait until March'09 to get it, as it was on back order. The good thing is that amazon.com sent me the Kindle-2 without me having to pay extra for it so it was worth the wait. Now that I have been using my Kindle for about amonth I can tell you this little gadget has won me over. I love using it, love how easy it is to put my own manuscripts in it. I can either email them to my kindle email and for $0.10 a manuscript, regardless of how small or big it is, amazon.com will put it in kindle-formatting and automatically send it to my kindle within seconds... literally! If I want to get this done free of charge then all I do is email my manuscript to my free.kindle email and amazon.com and I'll receive an email from them with my manuscript in kindle-format so all I have to do is upload it to my kindle. I'll keep adding more things that I like about the Kindle as I continue to explore its abilities. I'll also post my wish list for things it's not presently doing. In the meantime, I'd love to hear from visitors who own a Kindle. Let me know what you think of them! If you haven't seen SLUMDOG MILLIONAIRE already, you must, you just MUST go see it while it's still playing in your area. It's one of the best movies I've seen in a long time. I can't get it off my mind. It is awesome! It touches your heart on so many levels. Tender and chaotic, realistic and romantic, fast paced, yet with an exquisite sense of timing. Go see this movie and don't leave before the end credits roll or you'll miss a wonderfully exhilirating dance sequence. Then come back and tell me what you thought about it.